Research: Did that beaker just moo? Chris Young, a former computer help-desk technician living in Denver, woke up one morning in June 2004 barely able to move the right side of his body. He felt spasms in the muscles between his ribs and a painful squeezing in his torso. When he tried to walk, he had trouble lifting his right foot. "I was scared out of my mind," he recalls. A few days later, an MRI scan confirmed what Young already suspected from looking up his symptoms on the Internet: He had multiple sclerosis (MS), a chronic disease in which the body attacks its own nerve fibers. The day of the diagnosis was his 29th birthday. As his symptoms worsened over the next few years, Young frequently visited Internet forums for MS patients. In October 2007, a forum member described a new clinical trial at Johns Hopkins: Researchers would be testing cyclophosphamide, a chemotherapy drug ordinarily used to treat cancer, on patients with severe MS symptoms. By now Young had tried every known MS drug and nothing had helped. "I was dropping like a rock at that point," Young says. "So I figured, what have I got to lose?" He called the clinical trial's sponsor, Hopkins neurologist Doug Kerr, and was accepted for the study. On March 13, he was wheeled into Johns Hopkins Hospital to begin four days of intense chemotherapy. Hopkins neurologist Doug Kerr thought HiCy might "reboot" an MS patient's immune system, allowing nerve cells to repair themselves. "The ideas was to get rid of the inflammation entirely, in one fell swoop. When the immune system comes back up, we hoped, it would begin to behave better." Before the treatment, Young's abysmal short-term memory had him trapped in a state of fuzziness similar, he says, to what students feel after pulling an all-nighter. His wife would make lists to help him remember even two or three items-and he would promptly forget where he put the lists. Five days after treatment, Young woke up in the middle of the night and "everything was crystal clear," he recalls. The fog had lifted. "It was the freshest nap I've ever had." Within a week of treatment, he could stand in a bathtub without having to hang on to the walls. Three months after that, he was walking without a cane. Researchers began testing low-dose, long-term cyclophosphamide treatments in the 1980s. But that approach came with serious side effects. "It took the edge off inflammation, but it also made patients much more susceptible to infection, and even tumors," explains Kerr. He and Hopkins colleagues Richard Jones and Robert Brodsky had for years used high doses of cyclophosphamide, given over just a few days, on hundreds of patients with various autoimmune disorders such as aplastic anemia and lupus. In those patients, "HiCy" therapy reversed disease progression with minimal toxicity. Kerr thought HiCy might "reboot" an MS patient's immune system, allowing nerve cells to repair themselves. "The idea was to get rid of the inflammation entirely, in one fell swoop," Kerr says. "When the immune system comes back up, we hoped, it would begin to behave better." They were right. Of the first nine patients they treated with a high dose of cyclophosphamide, seven had a reduction in disability after two years. The results were published in June in the Archives of Neurology. Twenty-nine patients, including Young, have now been enrolled in a second trial, with similar motor improvements and no adverse drug effects so far. "In most therapies for MS, the goal is only to make the disease slow down a little bit. Here, people actually got better," says hematologist and oncologist Douglas Gladstone of Hematology Oncology Associates of Western Suffolk, in New York. Additional research by Gladstone, who served a fellowship at Hopkins in the late 1990s, has also shown the effectiveness of HiCy on 14 MS patients. "This potentially represents a new standard of care," he adds. The next step for HiCy development will be a phase-3, blinded clinical trial at multiple centers, Kerr says. For those patients whose disease did not go completely quiet with HiCy therapy, his team is also working on combination drug therapies that could be used after HiCy to increase its effectiveness. "These results are quite encouraging, but we certainly need to go further," he says. "This is only the first generation of trials." Richard Conn Henry's extraterrestrial epiphany came two years ago, at the Space Telescope Science Institute, a NASA research outpost on Johns Hopkins' Homewood campus. An old friend, Ed Weiler, now NASA's chief of science, was giving a talk in which he cast Earth's story as a science fiction tale viewed from a faraway galaxy. Suddenly, The Idea smashed into Henry like an asteroid. Henry, a professor of physics in the Krieger School of Arts and Sciences, recalls, "Ed said that in his story, there's this civilization somewhere in the galaxy that learned about our existence from observing the transit of our planet across the sun. I'm sitting there thinking, 'Holy smokes! Now I know where to look for other civilizations in the universe!'" 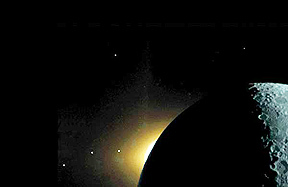 Clementine star tracker camera image showing celestial bodies along the ecliptic plane: (from right to left) the moon lit by earthshine, the sun's corona rising over the moon's dark horizon, and the planets Saturn, Mars, and Mercury. Richard Conn Henry thinks the ecliptic plane is the place to look for extraterrestrial life. Photo courtesy NASA For more than 60 years, scientists have combed the skies for optical or radio signals from those hypothetical other civilizations. An aphorism coined during the 1950s by famed physicist Enrico Fermi — "Where is everybody?" — cast a spotlight on the search for extra-terrestrial intelligence, which has grown into a bona fide field of astronomical research known by the acronym SETI. Henry believes that if alien societies exist and are situated along the "ecliptic plane," which is the plane of Earth's orbit extended through the Milky Way galaxy to infinity, they might, as Weiler proposed, have noticed the circling Earth transposed against the sun. If those faraway (and presumably technologically advanced) civilizations studied our planet, they might have noted that Earth is bathed in life-sustaining oxygen, and perhaps sent radio waves in our direction hoping to contact other beings — us. "My supposition is that if civilizations elsewhere have seen us through the ecliptic plane, they will have tried to contact us," says Henry. "If we find that they haven't after a while, then we'll likely know they're not out there." By limiting the search, Henry hopes to increase the chances for contact with The Great Beyond. "What we're doing is narrowing it down," says Henry, who compares parsing the ecliptic plane to finding a needle in a haystack by concentrating on the part of the haystack where you dropped the needle. "It's not done all that often. What we [ordinarily] see are scientists looking at the nearest stars, which I don't agree with because if civilizations were there, we certainly would have heard from them by now." The Hopkins physicist and two other scientists — Seth Shostak, of the SETI Institute, a private research organization in Mountain View, California, and Steven Kilston, a researcher now with the Henry Foundation, a family foundation run by Henry to promote scientific education — independently came up with the idea. The trio created a stir at the American Astronomical Society's annual meeting in June by constructing a poster noting that inhabitants of any planet situated within a fraction of a degree of the ecliptic plane could detect Earth passing in front of the sun every year. Were scientists to limit a SETI search to those planets, they could narrow the focus to 3 percent of the sky. The trio has put in a request for time on the Allen Telescope Array, a radio wave-sensitive device run by the SETI Institute and the University of California, Berkeley, to search for transmissions within the ecliptic plane. Henry has spent much of his 40-year career at Hopkins studying cosmic diffuse background radiation — rays in the universe that give hints as to its origins and physical makeup. But every now and again, "SETI finds me — I get drawn into it," he says. His hope is that a planet some 10,000 light-years away will have transmitted a signal and that earthbound scientists will detect it. But, he adds, that signal would now be 10,000 years old — perhaps from a species that no longer exists. "The odds that we find some civilization that is around our age and state of development are extremely rare, given all the possibilities," Henry says. Which is to say that, even if aliens have tried to contact us, we might still be all alone. As a young cardiologist, Victor Almon McKusick, Med '46*, became fascinated by Marfan syndrome, a disorder that affects a small group of especially long and lean people, many of whom ultimately die of a ruptured aorta. But it wasn't the involvement of the heart's main artery that captured his interest. It was genetics. McKusick made a career U-turn to study inherited diseases such as Marfan in hope of uncovering the genetic secrets behind them. Photo by Keith Weller Some colleagues "thought I was committing professional suicide in leaving cardiology to focus on rare and unimportant genetic disorders," he would later recall. But McKusick, who died of cancer July 22 at age 86, was ahead of his time. He became one of the first physicians in the country to start a medical genetics clinic, which opened at Johns Hopkins Hospital in 1957. Throughout the next several decades, he would become a world leader in mapping genes and identifying those responsible for thousands of inherited diseases, including a prevalent type of muscular dystrophy and several forms of dwarfism. More than 30 years before the sequencing of genes was laid out in 2001, he called for the complete mapping of the human genome, seeing it as a valuable tool in predicting and treating a host of illnesses. 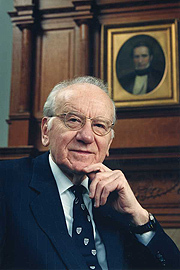 McKusick has long been regarded widely as a founding father of genetics research. His 1966 compilation of inherited disease genes — Mendelian Inheritance in Man — is now in its 12th edition, and has grown to three volumes that are continuously updated on the Internet. remained active until last year as University Professor of Medical Genetics. His 60-year legacy at Hopkins lives on through scientists who continue to unlock the genetic underpinnings of disease, some of whom perform their work at the McKusick-Nathans Institute of Genetic Medicine. This Hopkins research center bears his name and that of the late Daniel Nathans, a Nobel laureate and fellow Hopkins genetics researcher. This much could be gleaned from one day spent observing Marina Piccinini's flute master class at Peabody Conservatory: If you aspire to be a flautist of the first rank, you need a deep knowledge of the standard repertoire. You should know practice books by heart. You should stand up straight and always be in control of your air stream. Don't be too reverent. Be expressive. Practice kung fu. 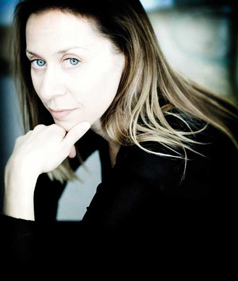 Marina Piccinini has taught flute master classes in Zurich for decades. This summer, for the first time she conducted a five-day class at Peabody. Photo by Marco Borggreve Piccinini, a Peabody faculty artist and director of the conservatory's flute program, lives part time in Europe and began leading annual master classes in Zurich, Switzerland, 10 years ago. But she wanted a class that more American students could attend, so this year for the first time she conducted a master class at Peabody. On June 1, 18 students from around the country, including four high school musicians, checked into the conservatory for five days of intense study and performance. On their second full day, students found seats in Griswold Hall for the morning session. Piccinini took the stage, surveyed the group, and said, "Is there an allergy to the first row?" A few people chuckled and moved closer to the stage. One by one, each student performed a piece of his or her choosing, standing onstage beside the seated Piccinini and accompanist Colette Valentine. A young woman named Katrina King played J. S. Bach's Sonata in C major. Piccinini listened, applauded with the audience, then asked King if she knew how to ride a bicycle. "Right now," Piccinini said, "you're on training wheels with your air stream." She pointed out a C that had sounded a bit flat because King was running out of air, and suggested that she stand more upright and not bob around so much while playing. "Whenever you do something physical, you change the music," Piccinini said. All morning, for any piece, the teacher could demonstrate passages from memory, not just for standard works by Bach or Mozart but compositions by Sigfrid Karg-Elert and Jacques Ibert and Pierre-Octave Ferroud. She knew the standard exercise books so well she could recommend specific lessons. When she examined the sheet music King used for the Bach sonata, Piccinini noted that many of the articulation and dynamic markings, added decades after Bach by an editor, were incorrect for baroque music. "Buy clean copies not marked up by editors," she advised the room. At the end of the day, after two rehearsal sessions, four hours with Piccinini, plus a two-hour piccolo class with Peabody faculty member Laurie Sokoloff, about 10 shy but game students assembled in a Peabody dance studio for a much different lesson. Piccinini is a dedicated martial arts student who believes musicians, whose work involves considerable stress from holding the same physical position for hours at a time, benefit from training in disciplines like yoga, kung fu, and tai chi. For her Peabody class, she imported from Vienna her friend and fellow advanced martial arts student Oluwafemi Oladeji to teach classes in breath control and relaxation. He led the students in breathing exercises and various stretches and movements to work out tension. "If you do not like pain," Oladeji told them, "breathe and ask it to leave." The students did their best, sweating in the hot studio and laughing a little as they began to feel less awkward. "Move. Shake. Shake," Oladeji advised. "It's your body, let it go. Relax. Relax." They let it go, they relaxed, and after 90 minutes they raced off to dinner. In the face of soaring utility costs, Johns Hopkins has decided to take energy production into its own hands and get a little greener in the process. Next year, the university plans to build a cogeneration power plant on the Homewood campus to supply a significant portion of the campus's energy needs. The plant will generate 3.5 megawatts of electricity, roughly 20 percent of the campus's current peak requirements. In 2007, the university paid energy suppliers an eye-popping $10 million to keep the lights on. David Ashwood, director of plant operations for the Homewood campus, says the proposed new plant, which will run on natural gas, could save $1.5 million annually and pay for itself in less than five years. "This is a significant money-saver for us," Ashwood says. "We looked into cogeneration as far back as 2000. What made this more viable [now] is that fuel and electricity prices have gone up dramatically in recent years. The economics never made sense until now." "Cogeneration" refers to creation of both power and heat. Ashwood described the plant as a small jet engine. Natural gas spins a turbine that drives a generator that creates electricity. Meanwhile, a heat recovery unit captures the "engine's" exhaust to make 20,000 pounds of steam per hour. The steam will be used to heat the Homewood campus's water and its buildings, power coolers for air conditioning, and provide steam to kitchens in campus dormitories and the Hopkins Club. The new plant, an addition to the existing campus power house, will be built on the parking deck next to Whitehead Hall. The university expects to put out a request for bid in January 2009. If all goes as planned, construction will begin the following March and the plant will come online in October 2009. State-issued bonds will help cover the plant's $7.5 million cost. Because the plant will run on natural gas, Ashwood says it could provide emergency power to a significant portion of campus and critical facilities in the event of a blackout. "Fortunately, gas outages are very rare," he says. He also likes the plant's environmental aspects. It will reduce the campus's carbon footprint because the university will purchase less electricity from regional coal-burning power plants. Ashwood says the new plant should allow the university to turn off the power house boilers during the summer months. Nationwide, dozens of universities have gone the cogeneration route, including Cornell, Rice, Princeton, and the University of North Carolina, Chapel Hill. Johns Hopkins will be the second university in the state to have its own cogeneration plant. The University of Maryland constructed a $70 million, 27-megawatt plant in 2003 to help reduce its own massive energy bill in College Park. 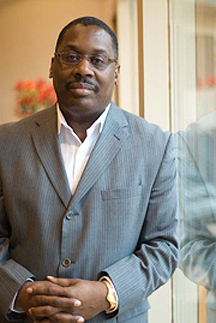 Thomas LaVeist first heard the buzz in health care circles about cultural competency in the early 1990s. Hospitals faced no end of challenges in dealing more effectively with people from a wide array of cultures. One day, it might be a patient who believes his bacterial infection has a spiritual cause and asks that his treatment include drinking green tea. The next day might bring a female patient from a culture in which women feel uncomfortable disrobing in front of male doctors. Such challenges dovetailed with his interest in studying race disparities in health care outcomes. But LaVeist, now director of the Bloomberg School of Public Health's Center for Health Disparities Solutions, was skeptical. Cultural competency was so loosely defined. Could it be measured? How could hospitals monitor how they were doing? "Cultural competency means looking at a patient's beliefs, values, how they perceive illness, their views about when to seek medical care. LaVeist had crafted other assessment tools, including one to measure patients' appraisals of racism in health care. He decided to tackle cultural competency, and spent four years developing a tool for hospitals and other health care organizations that would gauge whether they are providing quality care to ethnically and culturally diverse patients. Called the Cultural Competency Organizational Assessment-360 (COA360), the tool is a comprehensive Web-based questionnaire that measures how well hospitals are meeting the needs of patients of different races, nationalities, religions, and tribal affiliations. Here's how it works: Department administrators at a hospital answer 85 questions on the COA360 Web site about their perceptions of how well their organization interacts with diverse patients. Questions include: How well does the health care organization deal with the language needs of its clients/patients? How well does it deal with cultural differences? Physicians, nurses, and staff answer a subset of those questions. So do patients or their family members, and people who live in the hospital's service area. Furthermore, an administrator completes a 113-question statistical survey. The answers and data are then collated, and the final scores are compared to the cultural competency standards of the Joint Commission, the main health care accreditation body in the United States. The results help pinpoint where a hospital might be having problems meeting the needs of its diverse clientele. Photo by Tim Christmas "The nation is changing and rapidly becoming more diverse," says LaVeist. The U.S. Census Bureau projects that by the middle of this century, whites will be a racial minority of the U.S. population; already there are four states — Hawaii, California, New Mexico, and Texas — in which whites are not the majority. "As the patient population changes, health care organizations need to change to meet the needs of different races, ethnicities, languages, cultures, and countries of origin." LaVeist says his is the most comprehensive assessment tool of its type, and the only one that is Web based. "Much of what's being done focuses on individuals, on training health care providers to be culturally competent. But that approach may not be as effective as we need it to be," says LaVeist. "My approach is to try to create a culture within an entire health care organization that is respectful in regards to the diversity of the patients coming there." 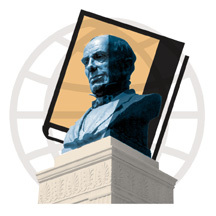 At the Johns Hopkins Medical Institutions, the international call center receives more than 1,000 calls per month from Hopkins units requesting language interpretation services. 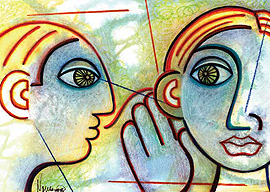 But cultural competency goes beyond providing interpreters, says Nadia Sawaya, program consultant for the cultural competency program at Johns Hopkins Medicine International. 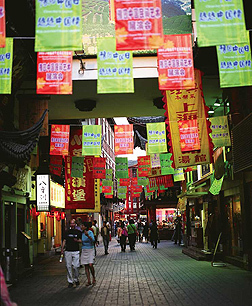 "We look at every encounter as an intercultural encounter," she says. "Cultural competency means looking at a patient's beliefs, values, how they perceive illness, their views about when to seek medical care. Everyone has the best intentions to care for patients, but there are these nuances that come into play." The COA360 is currently being tested and could become available to hospitals by this winter. Once it is complete, LaVeist wants to develop a new Web site that takes cultural competency one step further. He doesn't just want to measure it. He wants to help hospitals work on areas where they scored poorly. "The next step is to create another site that deals with intervention, to provide hospitals with guidance on how they can improve," he says. This summer, the Johns Hopkins community learned that Nicole Suveges, a graduate student in the Krieger School of Arts and Sciences, had died in Iraq. She and 10 others, including three Americans, were killed on June 24 when a bomb exploded in the offices of the district council in the Sadr City section of Baghdad. 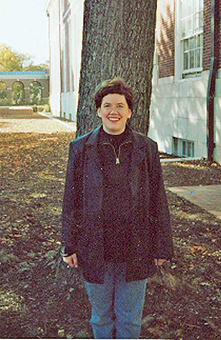 Nicole Suveges Suveges, 38, was working as a civilian political scientist, advising the 3rd Brigade Combat Team of the 4th Infantry Division. She was part of the Army's Human Terrain System program, which embeds social scientists with military units to help commanders better understand local populations. According to BAE Systems, the defense company that employed her, Suveges was helping to reduce violence and to rebuild infrastructure in the area. She was also researching her dissertation. Her adviser, Mark Blyth, an associate professor of political science at Johns Hopkins, says her academic work focused on the process of transitioning from an authoritarian regime, especially how that process affects ordinary citizens. In 2006, Suveges spent a year in Iraq as a civilian contractor and social science adviser to the military, collecting data for her thesis. Her second tour in Iraq would have supplied the rest of the data necessary to begin writing. University President William R. Brody told students, faculty, and staff about the loss of "one of our own" in an announcement the day after Suveges' death. "Members of the Political Science Department describe Nicole as an extraordinarily bright, engaging, kind person, intellectually curious and outgoing," he said. "She also was known as an active citizen of the department, regularly attending seminars and helping to organize graduate student activities. As a former Reserve soldier herself and as a person in her mid-30s, she brought a different and valuable perspective to the intellectual life of the department." Brody continued, "Nicole was committed to using her learning and experience to make the world a better place, especially for people who have suffered through war and conflict. In that, she exemplifies all that we seek to do at Johns Hopkins: to use knowledge for the good of humanity." Suveges is survived by her husband, retired Army Master Sgt. David Iverson, her two stepdaughters, and her parents.Iverson is creating the Nicole Suveges Fellowship at Johns Hopkins. Though the planning is in the very early stages, he says the fellowship will support national and international field work for political science graduate students. For most of 18 centuries, China was a world power, a major player in the global economy. But beginning with the First Opium War, from 1839 to 1842, the country entered a long period of national weakness. Now China has the world's fastest growing major economy and continues to invest significantly in modernizing its military. The U.S., says David Lampton, is too concerned with China's military power and needs to compete better economically and intellectually. Photo © Jupiter Images Corporation David M. Lampton, director of China studies and dean of faculty at the Nitze School of Advanced International Studies, begins his latest book, The Three Faces of Chinese Power: Might, Money, and Minds (University of California Press, 2008), by adapting political theorist Joseph Nye's definition of power as "the ability to define and achieve one's purposes or goals." After speaking with dozens of senior policymakers, mid-level officers, scholars, government officials, and policy analysts in China, countries on its periphery, and the United States, Lampton says it is clear that Chinese officials are looking for modernization to boost not only China's armed might, but also its economic and intellectual power. In his view, the United States seems too concerned about the first and insufficiently attentive to the rest. And he thinks that is a mistake. "Maybe since 9/11, maybe as a result of the Cold War, we gradually put more importance on the coercive elements of power," he says. "Seeing the largest [U.S.] problem with China as its military is unwarranted." Lampton argues that the U.S. should strengthen its own economic and intellectual capabilities to keep up with China's dynamic population, which now comprises 20 percent of the world's inhabitants. He says his book is meant to serve as a "mirror in which Americans can contemplate their own conception of power, its uses, and its limitations." Lampton notes that China still has a long way to go in solving its internal problems. In his book, he cites several obstacles to China's growth, among them demographic changes, pollution, water scarcity and other resource issues, social and leadership fragmentation, and gross energy demand. Taiwan continues to loom as a potential problem, especially if a conflict in the Taiwan Strait draws Beijing into military confrontation with the United States. The recent earthquake in Sichuan province shed light on a crumbling infrastructure, some of it left over from the days of Mao Zedong, and a local system of often corrupt officials whose only concern is maximizing gross domestic product. Rapid growth has already severely affected the environment within the country, Lampton explains, and will increasingly affect the global environment. "This is a long-term development problem that for generations will keep the Chinese occupied internally," says Lampton. "They realize that if they can't fix those problems, they won't remain in power." Despite China's rising might, Lampton does not think there's a large chance of an armed confrontation. The country's internal problems are of such magnitude, he says, its leaders will want to stay focused on domestic issues and resist getting sucked into any external conflict. "I think honesty requires that nobody can predict what something as large and rapidly changing as China is going to be like 20 or 30 years from now," Lampton says. "But if we treat China as a threat today, we will create the reality we seek to avoid tomorrow." Critically ill, bedridden patients often suffer from profoundly atrophied muscles, the result of long hospital stays with little exercise and large doses of pain medications that keep them still. Even after recovering from surgery, injury, or prolonged illness, many patients need additional care because they have become too weak to function. Bedridden patients are also more prone to depression and bedsores. Studies by Dale Needham, assistant professor of pulmonary and critical care medicine at the School of Medicine, have demonstrated that patients with life-threatening respiratory ailments and other conditions enjoy better outcomes when they begin rehab sooner. But intensive-care patients often are unsteady on their feet, and must stay connected to ventilators, heart monitors, and intravenous lines. For a patient to simply rise from bed and walk a short distance requires assistance from four hospital staff members. 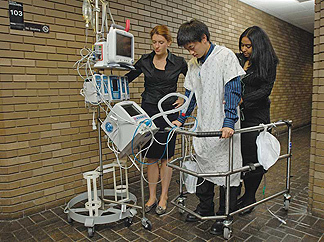 Engineering students designed this walker/chair/instrument tower to help ICU patients get up and about sooner. Confounded by this problem, Needham challenged biomedical engineering students at the Whiting School of Engineering to devise a solution. The result is the MOVER, a combination walker, wheelchair, and instrument tower that enables a patient to walk with the help of only two people — a nurse in front and a physical therapist behind. Designed by a team of eight Whiting undergraduates over the past year, MOVER tested the ingenuity of would-be engineers by presenting them with a batch of problems. What materials should the seat be made from? How could the walker best be integrated with a chair to catch a patient who suddenly becomes too weak to continue walking and has to sit down abruptly? How big should the contraption's wheels be to navigate hallways and avoid getting stuck in the floor slots of elevator entryways? The students came up with some novel solutions, such as using bulletproof nylon for the seat because it is easy to clean and resists infection. They also made the walker extend farther behind the patient than a conventional model, to ensure he or she has room to walk but can fall back into the attached seat if necessary. Despite their ingenuity, the device has yet to pass muster with Hopkins clinicians who want more improvements before patients use it. "It's been a very iterative process because we've constantly been told by clinical people how we need to change the design," says Joshua Lerman, Engr '08, the leader of the student team. "It has gone back and forth from the shop to the hospital 12 or 13 times, which is good for the students because that's the kind of thing we'll face when we're out in the world." Needham is confident that the MOVER, once it passes a final test or two, will catch on at Hopkins despite a medical culture nationwide that has been slow to grasp the virtues of incorporating regular rehab into a patient's recovery plan. "The goal is to minimize the morbidities ICU patients face when they leave the hospital," says Needham. "We're doing a very good job of helping our patients survive. Now, we need to do a better job of preparing them for when they leave here." Did that beaker just moo? Jason Matheny was shocked to see huge industrial poultry farms dotting the countryside of India. The public health researcher was already concerned about the environmental consequences of factory farming in the United States. Now large metal sheds containing thousands of chickens pumped with antibiotics and living in their own waste had come to the East. Factory farming had gone global. Robert Neubecker Some people might react by going local — eating organic "slow" food, and campaigning for others to do the same. Matheny instead decided to go to the lab. He thought he could use technology to give consumers an alternative to conventional meat. In 2004 he founded New Harvest, a nonprofit research group devoted to developing in vitro meat. Yes, that's meat grown in a lab, without a body attached. "The idea of in vitro meat has been around a long time, but it's only now that the technology is within reach to make this a practical possibility," says Matheny, a PhD candidate in health economics at the Bloomberg School of Public Health. Using tissue-engineering techniques, scientists regularly grow small amounts of tissue in the lab for medical procedures. To make in vitro meat, they use similar techniques to culture animal cells, which they then grow in a medium rich with nutrients. "Muscle tissue and connective tissue needs to attach to something to grow properly," Matheny says. "To make tissue out of these cultured cells, you have to grow them on a surface." One technique is to grow the tissue on a sheet of material containing thin grooves. The tissue cells align on these grooves and fuse to form myotubes, which eventually form myofibers, the building blocks of muscle. "The state of the art right now is creating one square centimeter of this muscle tissue," Matheny says. Cost is the biggest roadblock to getting past single-centimeter squares and growing in vitro meat in bulk, he says. The current process is so labor intensive, the meat costs thousands of dollars per pound. Matheny hopes that over the next decade, automation and the development of a less expensive growth medium for tissue cells will help bring the cost in line with that of conventional meat. Last April, People for the Ethical Treatment of Animals (PETA) offered a $1 million prize to the first person to produce commercially viable quantities of in vitro chicken at competitive prices by June 30, 2012. "The idea of in vitro meat has been around a long time, but it's only now that the technology is within reach to make this a practical possibility. — Jason Matheny New Harvest, which gets its money from individual donations, currently funds researchers at Utrecht University in the Netherlands. "The Dutch are the only group working on this technology full time," says Matheny, who is also New Harvest's director. Scientists are focusing on developing in vitro burgers and chicken nuggets instead of T-bone steaks and drumsticks because ground meat is easier to engineer, creates less waste, and is popular with consumers. "About half of the meat we eat is ground," notes Matheny. 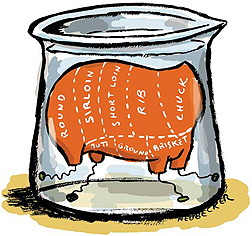 He adds that the flavor of in vitro meat should be comparable to that of conventional meat. "Ground meat is made mostly of muscle, fat, and connective tissue," he says. "We can make all of that in vitro. The other ingredients added to ground meat, like binder and seasoning, can similarly be added to cultured meat." Test tube meat has a number of potential advantages over conventional ground meat, Matheny says. For example, it could be engineered to be healthier and have a higher ratio of so-called "good fat," like the fat in salmon. In vitro meat could be produced under more hygienic conditions than those found in slaughterhouses and packing houses. "And you aren't producing the massive amounts of waste that we see in traditional livestock production because you are only producing the meat that eventually gets eaten," Matheny says. Matheny is a vegetarian. But when affordable in vitro meat becomes available, he has every intention of wolfing down a burger or a plate of chicken nuggets that began life in a lab, he says. "It's the only kind of meat I would eat." Photo © istockphoto.com / Siobhan Barton "With the case of oil, our brain isn't wired, but our nation has been rewired. 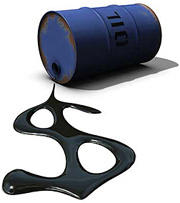 Our national infrastructure has been wired by cheap, plentiful oil. ... The most important single driver to get people to quit smoking is the rising cost of cigarettes. So with addictions, whether it's cocaine, nicotine, or oil, money talks." — Jack Henningfield, an adjunct professor in the Department of Psychiatry and Behavioral Sciences at the School of Medicine, talking to Elaine Quijano of CNN's "American Morning" about oil as an addiction. * This corrects earlier information published in the September issue print edition.